Warmzone, the expert and leader in heating technology, is helping you say goodbye to cold feet with radiant heated floors. Radiant floor heating features quiet design and no noisy fans and ducts to create a better living environment, making it an attractive alternative totraditional forced air heating systems. With radiant floor heating, your home is efficiently warmed from the ground up using a variety of situation-specific methods. There are several options available to best achieve maximum warmth in your home, and a Warmzone radiant heat expert will walk you through each of the types and recommend the best system. 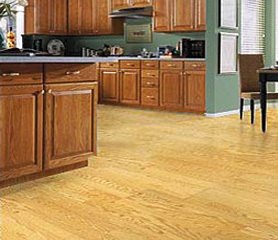 For example, for heated kitchen floors in a tiled kitchen, an expert might suggest the ComfortTile floor heating cable. At a diameter of just ⅛-inch, the floor heating cable is installed in the thinset so there is no floor buildup. If you would like your living room to have heated hardwood floors, ComfortTile, HeatShield Panels or low-voltage FloorHeat can be easily installed to efficiently heat your wood floors. Radiant floor heating is a solution for many types of homeowner woes. While there is a radiant floor heating solution for every living situation, finding the right version can be daunting. Because each customer has specific needs, and a heated floor requires science, not guesswork, Warmzone custom designs and engineers a heat solution just for you. Warmzone gives each customer a Computer-Aided Design (CAD) that is then matched specifically to the housing solution that works best. Whether you are building a new house that a heated floor system can be planned for, or adding to your existing floor, Warmzone has energy efficient ways to help. In-floor heat is not only more comfortable than forced air systems, it is more efficient. Heat needs to be turned on and left on less often due to the precision radiant heat system, and radiant heat will naturally fill a room rather than collect at the ceiling. Plus, each Warmzone heating system can be controlled digitally by a programmable thermostat that turns on different floors at different hours. Your home can be energy efficient at no cost to your physical comfort. With the large selection of radiant heating options, computer-aided design, and focus on energy efficiency, Warmzone can help you save money on heating without sacrificing comfort. The many benefits of warm floors can be experienced firsthand, and Warmzone's team of experts is always at the ready to help change your home's temperature. Warmzone can help warm your first steps to a cozier home, all you need to do is contact Warmzone for a free custom quote.